Eight hottest tech companies in Korea have been selected to pitch their business ideas in New Delhi. K-ICT Born2Global Centre (Born2Global) announced that "K-Global @ India 2018: Demo Day" event will be held at the Windsor Place (address: Windsor Place, New Delhi, New Delhi, 110001, India) on July 10, 2018, with the public program running from 14:30 pm to 18:00 pm. Panel discussion and seminar session for the entry into the Indian market will be held from 11:00 am to 14:30 pm. The eight presenting Born2Global member companies are GSIL, Exosystems, ulalaLAB, Ovitz, Day2Life, LUXROBO, SketchOn, and Alleys Wonderlab. These companies will share their latest technology and products in various fields, such as AI, IoT, Smartfactory, health-tech, robotics, wearable and VR/AR. They will be given about 120 minutes in total to pitch their products and services in front of the panel of judges and in front of the audiences, including local startup leaders, general attendees, potential mentors and business partners. Judges will evaluate each individual carefully and the winner(s) will be announced. Certain fund will be presented to the 1st place winner. In addition, the Korean tech companies will have opportunities to engage with the local community through trade booths to broaden their network and showcase their products. 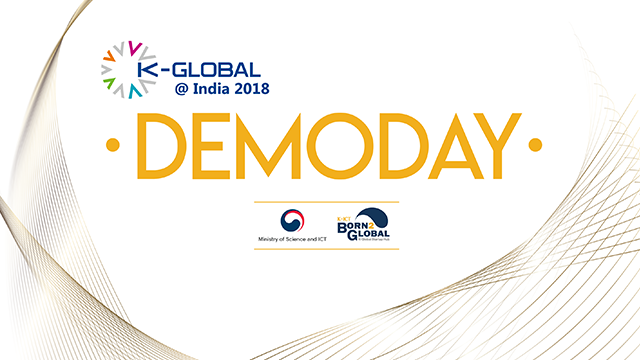 "K-Global @ India 2018: Demo Day" hosted by Born2Global is sponsored and supported by Ministry of Science and ICT (MSIT) of the Republic of Korea. Born2Global has held pitching events in various countries such as: Singapore, Japan, China, US (NY/SV/LA), Belgium, Netherlands, Russia, Luxembourg and France. "The event is great timing for Korean tech companies to meet the Indian community, mingle and learn from each other,” Jongkap Kim, Chief Executive Director of Born2Global said. Kim added that, "Born2Global has prepared K-Global @ India 2018: Demo Day with the purpose of introducing selected Korean tech companies with high potential successfully expanding to the global market. After the event, we plan to continue in solidifying the network channels between the Korean tech companies and VCs and accelerators of the Indian market." GSIL has established a system that preemptively detects risk factors in construction sites utilizing IoT/IcT technologies for integrated management for safety of workers. The establishment of the system for efficient management of workers on building and civil construction sites has led to the reduction of social costs, efficient work cycle and reduction of construction time utilizing big data analysis, prompt disaster response by identifying the location of workers. GSIL’s system is versatile, containing worker data, site environment data, and disaster management data that can be utilized for designing hazardous areas. Exosystems is developing a wearable joint rehabilitation solution with the motto "Fun at Home! Data driven Rehab." For rehabilitation patients suffering from the limitations of existing rehabilitation systems. Exosystems' rehabilitation solutions analyze patient biomechanical signals through wearable sensors and induce interest and motivation to patients through targeted rehabilitation programs to induce optimal rehabilitation training. Exosystems' rehabilitation solutions are expected to provide more effective rehabilitation at a lower cost than traditional rehabilitation training. Exosystems will provide rehabilitation solutions for various joints starting from the knee joints, and aims to develop wearable robots to support daily life. Easy and Simple IoT Smart Factory Platform 'WimFactory' for Small and Medium Sized Manufacturers WimFactory application can be completed if WICON connected with function sensors is attached to the current facility without change. It consists of two parts, smart factory IoT device 'WICON' and smart factory total administration 'WIM-X'. WimFactory measures/collects the data regarding production from facilities via 'WICON'. WICON sends the data to the cloud server for big data analysis and industrial AI. Based on the analyzed data, ‘WIM-X’ provides the monitoring service of facilities in real-time and the notification service about malfunctions and errors via PCs, smartphones and tablet PCs. It can also predict the troubles of facility. Ovitz's EyeProfiler is an accurate, compact, easy to use, portable and inexpensive vision diagnostic device. It embodies an advanced application of Wavefront sensor technology in a patented design to deliver high level of performance while keeping the device cost low. In addition, as the performance of our technology exceeds the initial expectation, we now can offer a customized contact lens solution which will strengthen our business case as well as market opportunities. TimeBlocks is a mobile planner app which have 1.2M downloads and 0.3M active users. Users can manage their events with 2 times less touches than normal calendar app. In addition, users can manage not only event having specific time, but also todo or memo in a single place. TimeBlocks analyze user's information related plans and recommend future plans which users would be interested in. MODI is a modular device for DIY IoT, and robotic creations. Just connect and Build with MODI module. The MODI App connects the smartphone to the Newtork module via Bluetooth. It allows the APP to control with MODI device. When it turns the APP on, it searches for MODI Network modules and connects automatically. It can enable and disable the Bluetooth fuction of its Network module via MODI Studio. With MODI Studio, it is easy to control the motion of the modules. "Prinker" allows users to apply a design to their skin safely in just a few seconds. Suggesting the easy, interesting and safe self-expression way by making a platform service combining of the "Prinker" which can print up the temporary tattoo directly on skin and 'online art gallery' is providing variety of images. Alleys Map is the world's first crowdsourced video map platform in first-person view for travelers. It processes street view video in first-person view uploaded by tourists, mapper and extreme activists, converts them into geospatial information, and provides them as a map-based service for virtual exploration and travel. Currently, the data collected by crowdsourcing today are about 5600 km of walkways and alleys in 23 countries. The average monthly growth rate is 56%. Recently, we have been producing 'virtual alley tour' in seven areas including Seoul and Busan, and working on a project to create user participation video map of Nepal's Himalayan Trail Course, US PCT, and Shikoku Pilgrimage Route in Japan.